1. For the sauce, combine all ingredients with a whisk or a fork; reserve. The sauce can be made in advance and kept overnight in the refrigerator. 2. Heat oven to 250F. For the pork, put ribs in ovenproof pan. Add ginger, garlic, white onion, cooking wine and oil to pan. Cover with water and stir in tamarind paste. Cover with foil and cook 3 1/2 hours or until the meat pulls away easily from bone. Allow ribs to cool in braising liquid until they can be easily handled. Slice rack apart into individual ribs. Heat vegetable oil to 350F. Lightly coat each rib in cornstarch and fry in hot oil until golden brown and crispy (2-3 minutes). Place on rack to drain and cool slightly. 3. 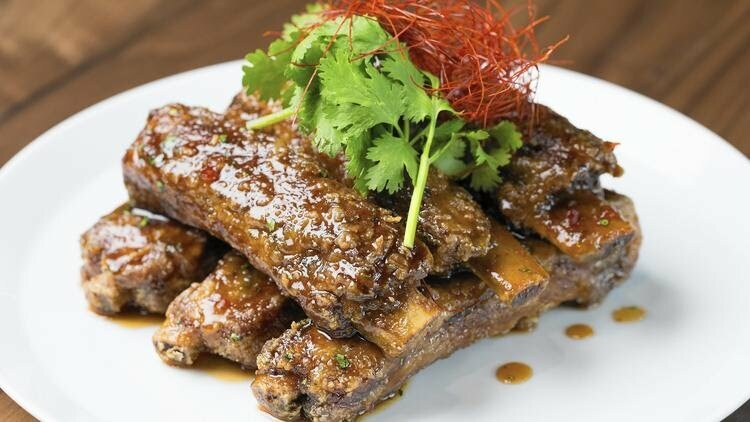 Toss fried ribs with the sauce and serve garnished with cilantro.